Join Leah for this playfully empowering, step by step exploration of basic hand balancing poses! Learn progressive steps to build a grounded yet invigorating experience in these poses! Discover where your individual growth edge is in each basic hand balance. Develop understanding of how to practice these poses safely on your own, and how to progress and deepen your experience within them. Going upside can be scary. We are used to having our feet on the ground and our brain on top! Yet when we go upside down something magical happens. Our mind is prompted to let go of it’s habitual cycles and for a minute, or two, or three...we feel free!! We are asked to trust, to connect with our courage and take in our new upside down perspective! 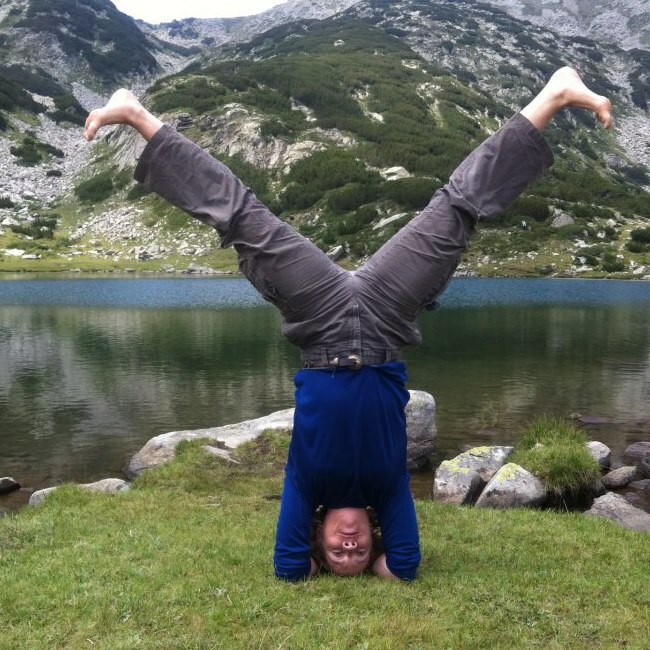 B.K.S Iyengar, calls inversions the YOUTH SERUM… Old blood that has gathered in the bottom of our bodies, legs and feet gets turned upside down and drains down toward the heart, reverses the heart pressure. When we come out of upside down poses the heart pumps new oxygenated blood into those tired cells, relieving head aches, varicose veins, (spataderen). During this workshop we will work in partners and small groups to SAFELY build from the foundation up and explore handstand preps & handstands, as well as simple hand balancing poses. The sessions include simple warm ups and will incorporate pranayama (breathing exercises) and meditation to digest our adventures in turning upside down and balancing on our hands. Leah Kline (Monday daytime 'Basic Alignment' teacher) shares many years experience in teaching bio-mechanically sound, alignment focused yoga inspired by ANUSARA. Leah brings a practical, humorous approach. She works from the same alignment principles that promote safety and a deep connection with your own inner energy. This course is for anyone who wants to learn the basics, even if you just took the Basic Alignment course, as well as new yoga teachers and regular students of Leah.